Coast Redwood High School "Go-Fund-Me" for the Ashland Shakespeare trip. *free pumpkin painting leaf pressing, leaf pile, scarecrow building, wear your costume and more! Lots of things to buy: beautiful succulents, fall veggie plants and seeds, raffle tickets, milkweed bombs and more! Last year we had a great turnout with 64 students from each and every program in our charter participating. This year the play will be, "Into the Well". Once again, it will be an original script written by Janinne Chadwick, which Amber directed and choreographed in 2008 with LPRT (Little People's Repertory Theater.) This story incorporates fairy tale characters from many different stories such as Little Red Riding Hood, Snow White, The Frog Prince, Goldilocks, Jack and the Beanstalk, and many more with a Giant singing Bob Dylan tunes, punk-rock huntsman, and runway models gone awry! Music ranges from Motown, funk, pop, punk, and good ole' rock n' roll. Come to our meeting to find out more details! 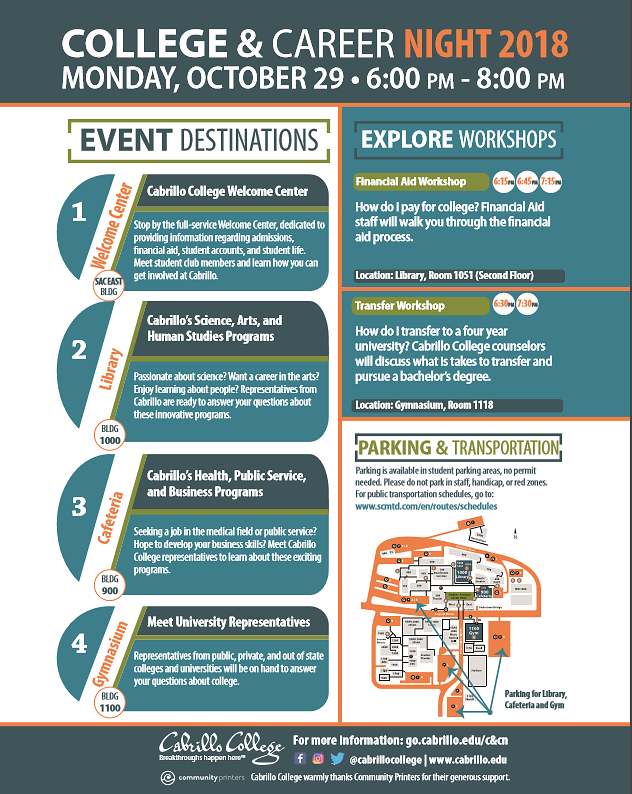 Begin collecting your EXTRA CREDIT points by attending the College & Career Night. More to come from your teachers! Seniors & their Parents should attend our last workshop of the year on getting money for College and receive 1-1 help on your FAFSA Application! Have your FSA ID created (Student & 1 Parent each create one) by clicking here. Parents 2017 Federal Income Tax Returns, W-2’s and other records of money earned. The following are helpful websites to assist in finding colleges and careers that fit your interests! The Watsonville/Aptos/Santa Cruz Adult Education Department will be offering a free GED preparation program at the SLV district office building on 325 Marion Avenue in Ben Lomond throughout the academic school year. (Please see attached flyer.) This course is for adults, age 18 and older, who want to receive their high school equivalency. Preparation Program for Students Studying for the GED and the HiSET Equivalency Test. An individualized course of study based on assessment, schedule, and goals will be designed for each student enabling students to pass the GED exams while improving their skills for college or career training. Courses are offered in teacher-directed classrooms with a blend of online, direct and individualized instruction. Online distance learning may be available in combination with classroom instruction. Don't Wait. Hours must be completed by the end of April 2019 and submitted with your memoir/portfolio! The Santa Cruz County Outdoor Science School is seeking energetic and responsible high school volunteers throughout the school year to serve as Cabin Leaders to small groups of 5th and 6th-grade students. Each Cabin Leader is paired with a Naturalist who they assist on the trail and during field studies. Cabin Leaders help ensure the student safety during daily activities and overnight in the cabins. All Cabin Leaders participate in Training the first and second day of the program before students arrive. Cabin Leaders arrive at 4 pm the first day of the program week and are dismissed at 12:00 pm on the final day program. In response to students and members of our community who are highly allergic to fragrances and scents, the SLVUSD Board of Trustees adopted a California School Board Association policy to make all district classrooms and offices fragrant neutral. CRHS has parents and/or students with respiratory issues who can have negative reactions to fragrances.